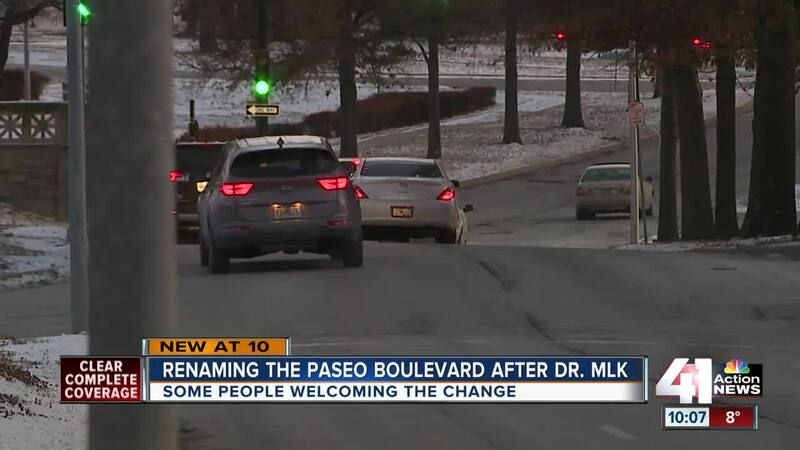 After months of formal debate and years of asking questions, Kansas City, Missouri has a street named after Martin Luther King Jr.
KANSAS CITY, Mo. — A Kansas City convenience store can now sell hard liquor after a months long dispute which included a local church. The issue was resolved the day after the 41 Action News Investigators reported on the controversy. Mike Thomas was stocking his shelves at Shotz Convenience Store at the corner of 27th and Benton with hard liquor Thursday afternoon. He wasn't sure he'd ever be able to do it or stay in business after investing about $15,000 in the alcohol. "It will make a huge difference. Customers come in, they walk in and if they don't see liquor on the shelves regardless of whatever they may want, they want to get it in one spot," Thomas said. Thomas had been in a struggle with Kansas City's Regulated Industries to sell hard liquor since November. He says as part of a 2017 gentleman's agreement, he told Pastor John Jones of nearby Highland Missionary Baptist Church that Shotz would only sell beer and wine his first year with a liquor license to show it wouldn't be a problem. What neither Thomas nor Pastor Jones expected was the church being put on Shotz's liquor license and required only beer and wine sales. And that license said only the church could lift the restriction on Shotz to sell hard liquor. Pastor Jones was upset by it. When the 41 Action News Investigators asked him if he wanted the church to be in the regulation of alcohol business, he said, "No, no, not at all." The day after the 41 Action News Investigators reported both Thomas' and Jones' concerns about the liquor license dispute, Regulated Industries issued a new license to Shotz for retail liquor by the package back dated to December 1 when the first license expired. When the 41 Action News Investigators asked Thomas if would've received the license without the Tuesday story, he replied, "No, no I don't. I'll be honest, me and the pastor would still be wondering how this happened." Just like his past conditional license, Shotz must have sales of at least 70 percent of non-alcoholic merchandise, which Thomas says he did under the beer and wine license. He believes it won't be a problem for his store, which also includes a grill, to reach that requirement. With the delay in liquor sales, Thomas has already laid off one worker and cut inventory. He says it may take a few months to completely recover. And he believes it was all avoidable. "If it happens to me it can happen to somebody else and the church doesn't need to be defaced like that," Thomas said. Regulated Industries' Jim Ready originally told the 41 Action News Investigators Thomas would have to get a letter from the pastor and re-petition the neighborhood to get a full liquor license which could've taken months. Ready confirmed the full license was issued Wednesday without those obstacles, but offered no further comment.